Songkran is the Mother of all New Year celebrations. April 13th – 15th is the traditional New Year in Thailand, it’s the time of the Songkran Festival, the mother of all New Year celebrations. The Songkran festival is celebrated without reserve in Thailand, it’s a mega party like you’ve never seen before, the drink flows freely, inhibitions are lost and spirits rise to the tempo of the music as the worlds biggest street party brings the nation to a standstill. What to expect during Thailand’s Songkran Festival. Besides lots of merriment and celebrating there will be water, lots and lots of water, the biggest water fight in the world. The highways, roads and streets become a procession of trucks carrying revellers armed with water canons, water pistols and buckets, as they proceed they engage passing trucks and roadside revelers in battle. Beware of the hidden extras. Although Songkran is celebrated in goodwill you are likely to get a shock or two, here are a few things you should be ready for. Mentholated talcum powder which stings your eyes. High powered water cannons, these are potentially dangerous if aimed at your eyes. Chalk paste smeared on your face. No mercy, many Thais and foreigners alike are insistent on blessing you with chalk or powder paste. Some people like to get a reaction, or see the reaction to freezing water, that’s all good fun if you choose your victims wisely. Others would like to come up with the ultimate water cannon. who knows what next, dye in the water ?, balloon water bombs ?, be realistic, Songkran started out as a new year blessing, then it turned in to a fun water fight. It’s fun just the way it is, don’t try and change it or escalate it, there really is no need. 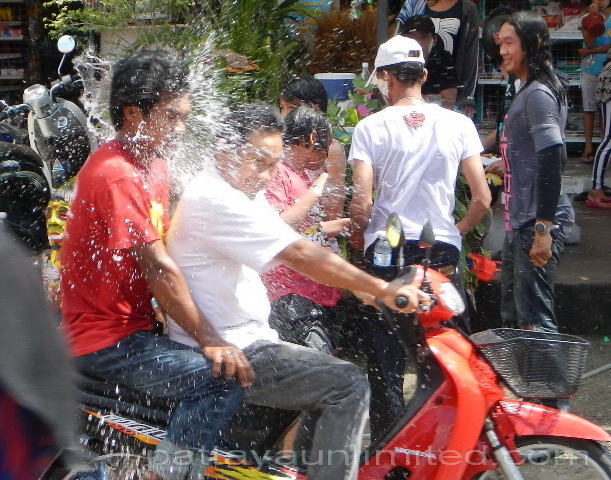 Prepare yourself for Thai Songkran fun. Thailand’s Songkran festival is good fun if you know what to expect and you are a willing participant, so here are a few tips, or maybe we should call them “Songkran rules of engagement”. Keep your money, cigarettes or any valuables in a secure waterproof plastic bag. Leave your gold at home, a drunken reveller makes an easy target for opportune thieves. Avoid using a motorcycle, over exuberant revellers have no regard for your safety. Don’t target peoples faces with high powered water cannons, especially motorcyclists. Respect peoples wishes if they don’t want soaking. Keep smiling and don’t lose your temper. Take a waterproof camera or use a waterproof case for your camera. Five on a motorcycle, looks like fun but it’s dangerous. If you go out to enjoy the Songkran festival, it will be fun, but remember the most vulnerable are the most popular targets. Everybody likes an exposed, defenceless moving target, so if I was you I wouldn’t do Songkran on a motorcycle. Targeting motorcyclists in the face, especially with high powered water cannons or freezing water is not recommended. Avoid shooting people in the face with high powered water shooters, the advantage of these water cannons is that they can shoot water with great force and achieve long distances, but that force is enough to cause serious injury to a persons eyes. It’s not nice with ice. Remember it’s Thai New Year, the tradition is to pour water into the hands or over the shoulder and down the back, you can accompany this by saying Sa Wat Dee Pii Mai “Happy New Year”, or Suksan Wan Songkran “Happy Songkran Day”. Most people like to participate in the Thai Songkran festivities at least once, but for many once is enough. If you would rather not partake then it is best to stay within the confines of your hotel, if you stay in a house, condo or apartment you best make sure you do your shopping in advance and stock up with food and provisions to last you through the Songkran period. If you want to celebrate Songkran elsewhere in Thailand ensure you get there before Songkran starts, otherwise you may find yourself stuck in gridlocked traffic. Although New Years Day in Thailand falls on the 13th of April the Songkran celebrations may go on for a week or more. Districts and sub districts throughout Thailand will celebrate Songkran on different days, remember this when planning ahead. Don’t become a Songkran fatality statistic. The mortality rate is always extremely high during Thailand’s songkran period, this is usually due to traffic accidents caused by drunk driving, it’s definitely not a good time to take a motorbike taxi.